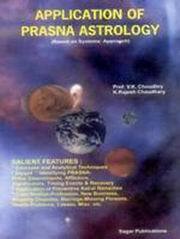 Prasna is a very important part of astrology and is very useful. In some cases, only the prasna astrology is helpful. The Prasna means when we reply a question based on the horoscope prepared for the date and time when a quitrent has approached for astrological help. V. K. Choudhry is a well known Indian Vedic astrologer. His major contribution to Indian astrology is the Systems' Approach for interpreting horoscopes. This is also known as SA in the modern astrological literature. V.K. Choudhry has written many books and articles since the early 1990s with the aim of helping those who wish to learn predictive astrology with greater accuracy. His main emphasis is that people should learn astrology to make their lives happy. People can enjoy better health, better mental peace, better relationships and better professional success if they learn astrology.